I wanted to experiment with different cooking methods, and one that seemed to check the “vaguely healthy” requirement list was simmering a roulade. So, just what is a roulade? The word is taken from the French “rouler” meaning “to roll” and that’s pretty much all it is: a roll. I stuck to fairly safe ingredients, ingredients that I knew fit well with each other, and just tried to figure out a way to cook it that was healthy (-ish) but tasty. All ingredients are fairly open-ended as it is more experiment than recipe. Try it for yourself with any variations you prefer. 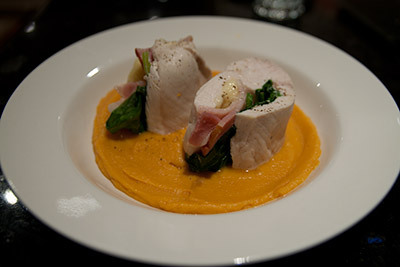 Using a spoon, spread out a layer of sweet potato purée, unwrap the chicken breasts and slice into thirds (with two pieces per serve) arrange on top and add cracked pepper, a pinch of salt, and perhaps a drop of extra virgin olive oil. The first time I experimented, I didn’t second wrap my roulades in aluminium foil, so the cling film peeled itself off as they cooked, releasing all those meat juices into the pot water. Also, I was lazy and simply poked the roulade with my Thermapen without unwrapping and re-wrapping it, which to some extent released meat juices as well. So that’s why I experimented again. If there’s anyone out there, and you give this a go, let me know how you went! 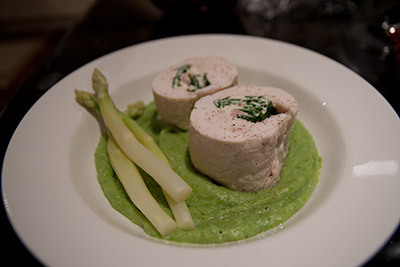 This entry was posted in food and tagged chicken, recipe. Bookmark the permalink.